The entrance to the Fr. 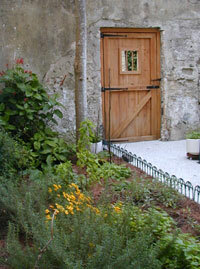 Miguel O’Reilly House Museum is through a garden gate just off Aviles Street. And as soon as you cross the threshold you realize you’ve entered a special place. But just how special may not be readily apparent. Not only are the fruits, vegetables, herbs and flowering plants that surround you indigenous to the area, everything growing in this wonderful garden would have been growing in St. Augustine gardens going back to the early 1800s. So in effect, simply by setting foot in this peaceful, walled garden filled with God’s bounty, you will have been transported back to the time when Fr. Miguel O’Reilly lived in the house you are about to enter. Meticulous research was undertaken to ensure the garden’s authenticity, and meticulous and loving care is the order of the day to ensure that everything planted here is able to thrive in St. Augustine’s sub-tropical climate. There are three types of flowering plants; eight types of fruit trees and plants; fifteen varieties of herbs; and ten types of vegetables that grow in the summer garden and another five that grown in the winter garden. Among the flowering plants are coonties used by Native Americans to make flour. The fruits include pomegranates and strawberries used for both medicinal purposes and food, as well as figs, the most ancient of all cultivated fruits. Two of the more ancient herbs in the garden are calendula and hyssop. Calendula is used as a remedy for a number of ills including toothaches, cramps, fever, flu, and tuberculosis. Hyssop was considered a holy herb in ancient Egypt. It is used to settle digestive and respiratory disorders, sore throats, coughs, and fevers. The centerpiece of the indigenous garden is the 1865 baptismal font, which, when it was in the cathedral’s baptistery, was used to christen generations of St. Augustinians. It continues today as a symbol of eternal life. The garden is a perfect place to spend some time meditating and admiring God’s goodness. Visitors enter the Father Miguel O'Reilly House Museum through the garden gate just off Aviles Street and immediately step back in time. 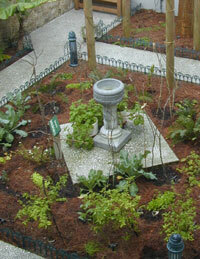 The garden, with the Cathedral's old baptismal font at its center, has many varieties of indigenous plants, herbs, and vegetables known to have been grown locally in the 1800s.